Inspiring Urban Farm Grows an Astonishing Three Tons of Produce a Year on a Mere 1/10 of an Acre | "Global Possibilities"
With food prices steadily rising over the last several years, by as much as five percent, families are scaling back and going without many staples just to put a meal on the table. Or worse, resorting to ‘bargains’ like fast food specials, subsidized SNAP junk food or just plain instant noodles to fill a hungry belly. We have reached the point where self-sufficiency is not a luxury any longer, it’s a real necessity. In response, many are carving out a small homestead niche, even in the middle of lively cities. An encouraging example is found with a micro-farm in the heart of Southern California. It isn’t much of a stretch to see our food dollars are shrinking. A combination of droughts, erratic weather patterns and astronomical fuel costs have all contributed to an inflated food bill. The use of GMO seeds isn’t helping the matter either with horrible crop yields. Couple this with a nose dive of world economies and we have a recipe for wide spread shortages of quality, nutritious food. Individuals are waking up to these realities and taking matters into their own hands — not only growing their own food, but removing themselves from the grid as much as possible, even within the bounds of a bustling city. 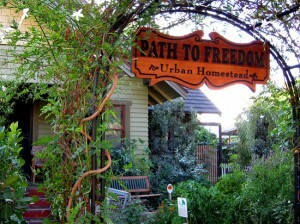 A shining model of exceptional self-sufficiency, survival and ecological action is the Urban Homestead.